In an effort to re-rail this thread, I spotted this cracking job via my obsessive nosiness on Twitter (may even be one of the people on this forum). Had exactly the same problem as you, and only just out of contract. I was fuming on the weekend when it happened and just bought another box (£130 Amazon, not bad in truth). Something wasn't sitting right with me, looked through the grill at the top it seemed like the HDD was completely exposed, and the clicking seemed consistent with HDD failure. Thanks for the tips on deconstruction. I took an old 160gb drive, right out of an old laptop. Unfortunately that didn't work, so I formated it on Win 10 (NTFS) plugged in back in and voila. Might purchase a larger disk but should still be £90 better off! Installing a new hard drive in mine seemed to fix the issue - for a short while - then it came back. I installed a new larger drive and didn't have to do anything with it (no formatting in advance) but be aware that the YV software may not be able to use the whole of a very large drive if you are tempted to go for something massive. I do not believe that my old drive had failed (yet) but am in the process of replacing the capacitors - was going to work on it last night, but ended up spending the evening in hospital. It could be a batch of bad drives, but if the drive failure was caused by bad capacitors, it could cause any replacement to fail the same way so be wary of that. I was on the Toppy forums with Andyfras who has just done the cap replacement on a YV box and he tested the failing capacitors on the box and found them way out of spec. Andy offered a capacitor kit or a repair on the Toppys, and says he can now do the same for the YV boxes. If anybody is tempted to try a DIY repair, it is difficult to get the solder to flow - which may be due to the double sided circuit board or use of unleaded solder. My 12W iron (used to repair my Toppy) wouldn't cut it, and although I was finally able to get all 10 caps off with a 30W iron, it was hard work and the desoldering braid didn't work too well so I still have to clean up the holes for the new caps. Does anyone know what Brand of capacitors Humax used on the motherboard of the newer boxes? I have a couple of BT DTR-T2100 boxes, and one of them starting failing to get past the waking up stage. You would hear a click and it would restart. I bought a new hard drive (Seagate 1Tb STBD1000100) and plugged it in. Powered it on to standby only. Pressed down button until power state went to blue. No message on screen about maintenance mode. Tried with a different screen in case not seeing the Maintenance Mode option was a screen issue, but no different. It seems to be doing something with the down button because it is slower getting to Waking, but at the end of the day it isn't getting anywhere. I think you are supposed to put the disc in, power the box on, and wait, without doing anything else, while the box figures it has a cuckoo in its nest, and de-cuckoos it. The less welcome hypothesis is that it wasn't the disc at fault, so changing it hasn't made any difference. I think you are right about it being something else. I took the new drive out, formatted it as exFAT, put it back in, but that didn't make any difference. I then took the drive out again, and looked at it in Windows and it hadn't been altered by the Youview box, so it isn't initialising it. I'll get another box and try the old drive in it. With regards to a new drive, I'm not sure under what conditions it decides to auto-wipe and initialise/set-up a drive. Perhaps only when there's no partitions on it at all, so that might explain what's going on with your exFAT one. I would definitely go into maintenance mode and manually request a full wipe and reset with a brand new drive (last option). You have to turn the box on with the power button on the front and then quickly switch to pressing down to get into maintenance mode, not just press down from standby. It should be no more than a few seconds before you are asked about maintenance mode, at which point tap power to indicate "yes". Also I wouldn't try putting a hard drive from one box into another box if you want to keep the recordings, it may cause problems further down the line or indeed decide to wipe it straight away due to a difference in originating box IDs - I'm not sure. This functionality is provided by the OEM low-level software, not YouView's, so I'm not 100% familiar with exactly what happens when you go off-piste in an unsupported way with new drives like this (and indeed it may differ box-to-box), plus it's 11pm and I don't have boxes in front of me, I just wanted to steer you away from doing something potentially destructive if you're doing it now and direct you to something more likely to work. Tried that but still no Maintenance Mode option. I'll see if I can buy a secondhand box and try the new drive in that, then if that works there is the option of cloning the old drive to avoid risking the recordings. Maybe the button is faulty as well, but I don't want to start pulling apart my other box. 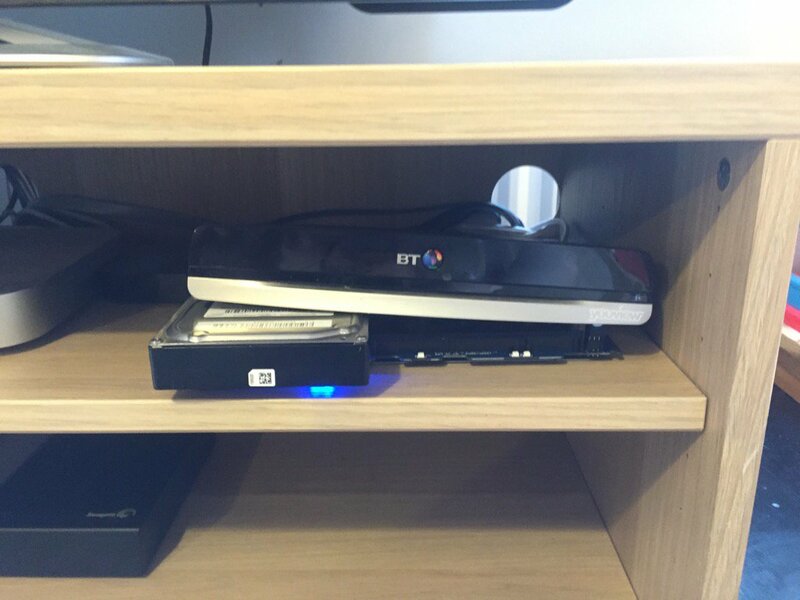 You won't be able to play the recordings off your old drive on a different youview box. It's down to the content control broadcasters put on high definition channels. Plus if you do place a hard drive in a box it didn't originate from you risk the box doing something destructive. If you are going to try and clone it don't put the original in a box first and at least if the clone formats you have lost nothing. In all honesty though I'm like 99% certain it won't work however. My only concern would be how the YV firmware handles any disk reorganisation - if it does - as with SSDs you only need to do a "trim" (in Windows speak), not a defrag etc.